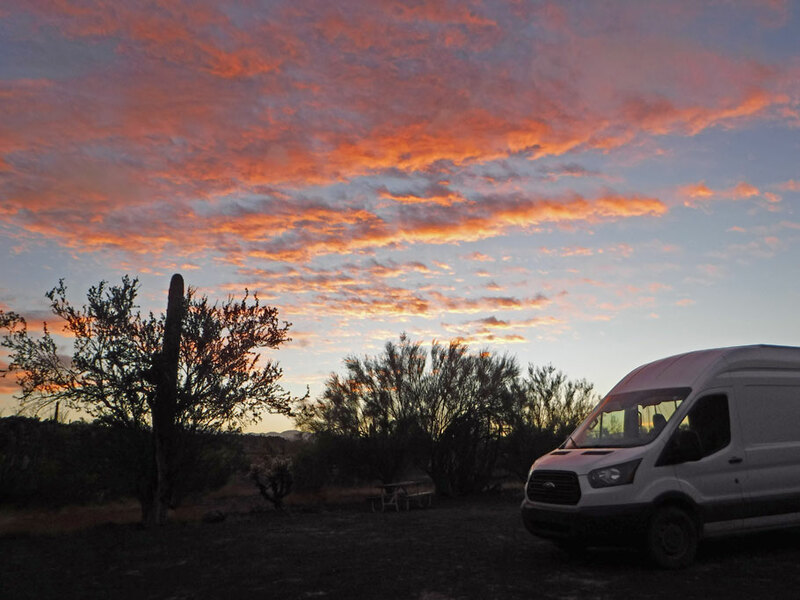 Racing the sun to get to our first campsite at El Pinacate. November 29 – December 1, 2018. Our crossing into Mexico went really well except for one little snag (luckily we were literally able to back out of it). 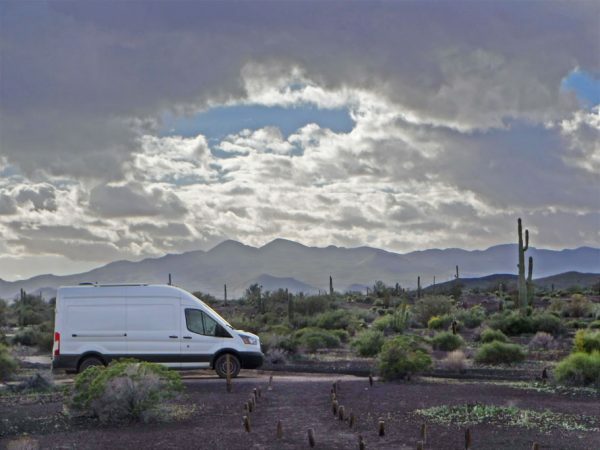 I was worried as I always am before transiting to another country but I had done some research and it looked like Nogales Arizona/Sonora would be our best bet for a no-hassle drive across the border. Before we left I found this post on another blog. It had pictures of all the points we needed to be aware of and directions about what lanes to be in. Unfortunately, we did get in the wrong lane once but were ultimately able to back the van up far enough to find a break in the lane barrier big enough to squeeze out of. My biggest worry was the weight of the van. There seems to be confusion about what the allowable cargo weight is for a truck camper coming into Mexico. And although we are not a truck camper, I had been warned it might apply to us too. After all White Whales (Ballena Blanca) are a bit hefty. It is too confusing for me to adequately explain the whole weight problem (and I have other confusing stuff to explain later in this post) so let me refer you to this website if you are curious or planning on taking a truck camper or cargo van into Mexico. There are several stops once you get into Mexico before you can truly be on your way. A vehicle inspector looked in through our back door at the first stop and waved us on – thankfully, no questions about Ballena Blanca’s tonnage. The next stop was to enter a toll road. We saw a motorcycle in front of us stop and hand someone something, but when it came to our turn someone walked up to our window and said: “Go, go, free!”. A couple of guys manually lifted the boom barrier and off we went. Our last stop was down the road a bit at km 21 to get our tourist visas and Temporary Import Permit for the van. Here we had to actually stop and get out to do all our business but luckily there was a big parking lot – totally unlike our experience crossing the border in Tecate earlier this year when we had to drive down tiny streets around town to find a place to park. There were a handful of other Americans also getting permits at the km 21 stop and we were able to get the scoop on the toll station. We were told they were on strike. Later we would learn that the actual workers weren’t striking but that it was a protest. The booths were being commandeered and people were being let through for free. They were also collecting donations for their cause. We are not actually sure what the cause was even though at one toll booth we were handed a flyer about the protest. The flyer had a list of constitutional articles that we assume the protesters thought the government was breaking. Anyways – our toll budget was reduced and I’m always in for protesting the tyranny of an unjust government so we handed out a few donations at subsequent toll stations as we zoomed by the poor toll collectors idly sitting in the collection booths ignoring the whole thing. 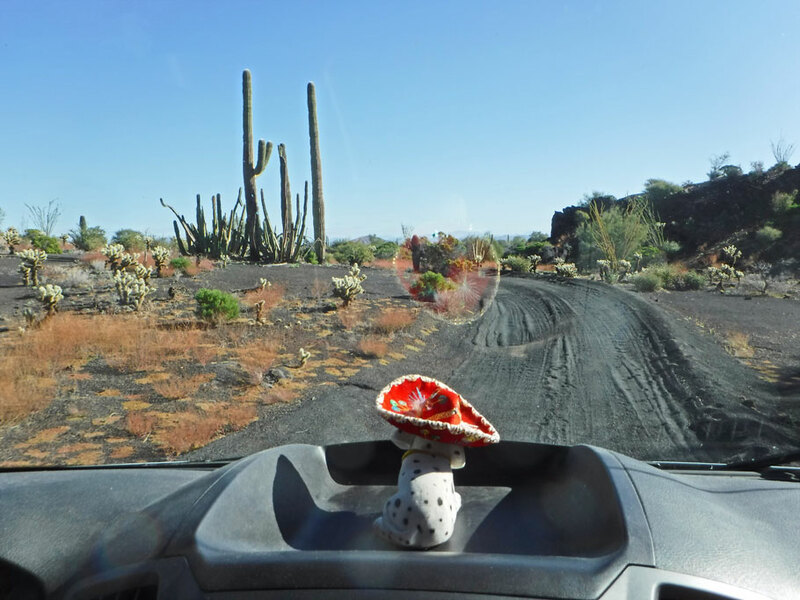 Our first destination on our Mexican journey was Reserva de la Biosfera El Pinacate y Gran Desierto de Altar. 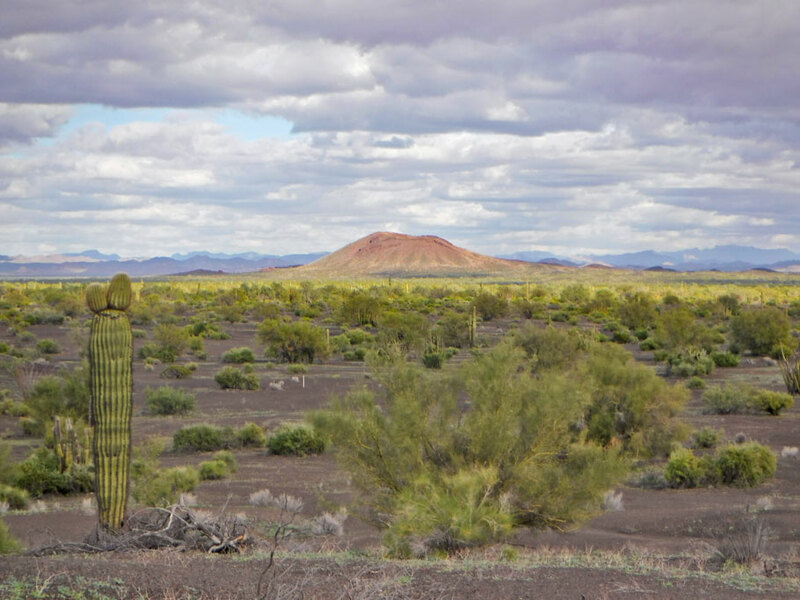 It was located west from km 21 almost back to the border of the US abutting Organ Pipe National Park. We passed through many small towns on our way. The roads were good until we got on Highway 3 just outside of Puerto Peñasco. Potholes abounded – but never fear, some enterprising Llantera Movíl (mobile tire store) business had posted signs with their phone number after every stretch of bad road. We stopped in Puerto Peñasco and got beer, money, and gas and made our way to the Reserve where we were planning on camping. There are two entrances, so we stopped at the first to inquire about spending the night. After 5 miles down a dirt road, we finally came to a very modern visitor’s center. This visitor center was private and a separate fee from the rest of the park. The attendant there told us we’d have to go to the other entrance north of there to inquire about camping. Back 5 miles down the dirt road and 13 more miles up a paved road we found the second entrance and the place where we could buy our tickets to the reserve. It had been a very long day by this point. We’d started at 5 am in Tucson and it was now after 3 in the afternoon. At this second entrance, we found out that our day wasn’t quite over yet. We still had a couple hour drive down washboard rough roads to get to the campsite. This was fine except for we had to pay for each day we were in the park including this day which we would spend the rest of just driving to our camping spot. We decided to stay two nights, so we paid for 3 days. In the end, it only came out to about $20US for everything (camping and entrance to the park). We got to the campsite about sundown and cracked open a few of those beers we bought earlier to celebrate the end of 12 1/2 very long hours and our first night of our Mexican journey. Then the next day dawned and at some point, we realized that we had made a huge mistake by getting to the park so late. Why? Because the park is laid out in a mostly 50 mile one-way dirt road loop. Ok, let me explain. Imagine the route through El Pinacate is shaped like a lollipop. There is a long stem which is a two-way path and then the pop is a one-way circle on top of the stem – except that it is really shaped more like a chicken, but we are going to pretend it is a circle for this explanation. Now imagine a clock face on the circle. The stem comes in a 6 o’clock. And then there are spur roads at 8, 10, and 1 o’clock. The spurs are two-way roads even though they are no wider (meaning only wide enough for one vehicle) than the one-way loop around the pop. The 8 o’clock spur is a short rough road that goes to the volcano El Elegante, 10 o’clock is a long rough road going to the campsite, and 1 o’clock is a very short road going to the volcano Cerro Colorado. When we arrived we had to “sprint” up to 10 o’clock and then take the spur to our campsite before dark (a two-hour drive), passing by the volcano at 8 o’clock. The next day we went back down the campground spur and entered the loop again at 10 o’clock and drove to Cerro Colorado at 1 o’clock. This took us a couple of hours. We hiked the volcano and before we knew it it was almost 2 pm. We ate lunch and headed around the low numbers of the clock face doing like we do, stopping at absolutely every interpretive station we saw, making our way back to 8 o’clock (which we skipped the previous day) to see the second volcano, El Elegante. As we bounced down the washboard loop at five and sometimes rare stretches of 25 miles per hour, I realized that once we passed the stem of the lollipop at 6 o’clock we were going to have to do the whole loop again in order to get out. We could skip El Elegante once we got to 6 and leave the reserve – but skipping the chance to walk around the rim of another volcano wasn’t likely. When we paid for our tickets the previous day the park ranger had mentioned that we could drive the wrong way on the loop before the park opened in the morning at 9 am. Obviously, he understood our problem even though we didn’t at the time. So that is what we decide to do, except that we didn’t go back to the campground and just parked overnight at the last volcano which we arrived at close to sunset. I timed the trip from 6 o’clock to El Elegante so we would know how long the wrong way drive to the stem would be in the morning (40 minutes). is if you want to see El Pinacate, arrive early, drive to El Elegante, then to the campground, spend the night, then drive to Cerro Colorado the next day, then out of the park. Just like the rest of Mexico, it is all easy once you do it wrong the first time! * We had planned to spend our third day in the Refuge exploring the sand dunes and interpretive trails at the southern entrance. El Pinacate is open every day of the year but unfortunately, the private visitor center at the other entrance is not and December 1 was a holiday (Inauguration Day – Mexico just elected a new president). When we arrived at the southern entrance we found a locked gate closing off the road into the park. 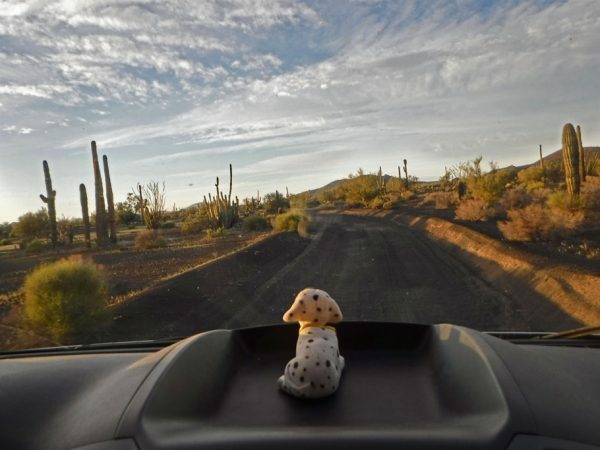 * El Pinacate is in the Sonora/Baja free zone – meaning that you only need a tourist visa to go there and don’t have to get a Temporary Vehicle Import Permit. We recommend it despite the washboard roads – you just have to go slow. We do not recommend towing a fifth wheel or taking a camper much larger than ours. There is limited room to turn around at both craters. Made it to the campsite just as the sun was setting. Near our first night’s campsite at El Tecolote, where the volcanic rock has turned to miles of black dust. Looking down into Cerro Colorado. It is one of eight maar craters here in the preserve. 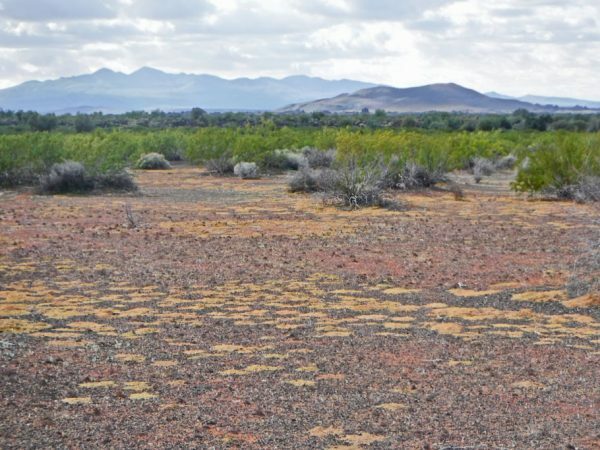 The term ‘maar’ indicates that the crater floor is below the surrounding ground level. These craters were created when rising magma came in contact with the underground water table. The rapid increase of steam pressure blew out the rock and soil above. Another view of Cerro Colorado. Looking from the rim of Cerro Colorado back to the lava field near El Tecolote. NASA used the volcanic terrain here at El Pinacate to test equipment and train astronauts for the Apollo moon missions. Ground cover in the foreground can go unnoticed on brown desert dust. But stands out on the black volcanic dust. Cerro Colorado seen from a distance. 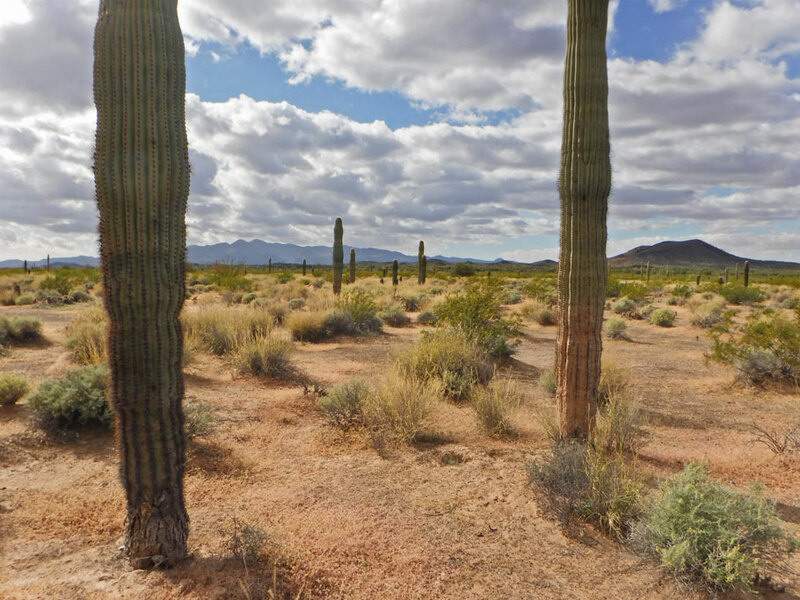 Although there are a few saguaros in the crater, it mostly lacks the creosote and palo verde seen all around it. There is not much agreement on the age of the crater, but it may be young. It was omitted from the first Spanish description of the area. The Tohono O’odham have tales of its creation. It may be as young as 150 years old. 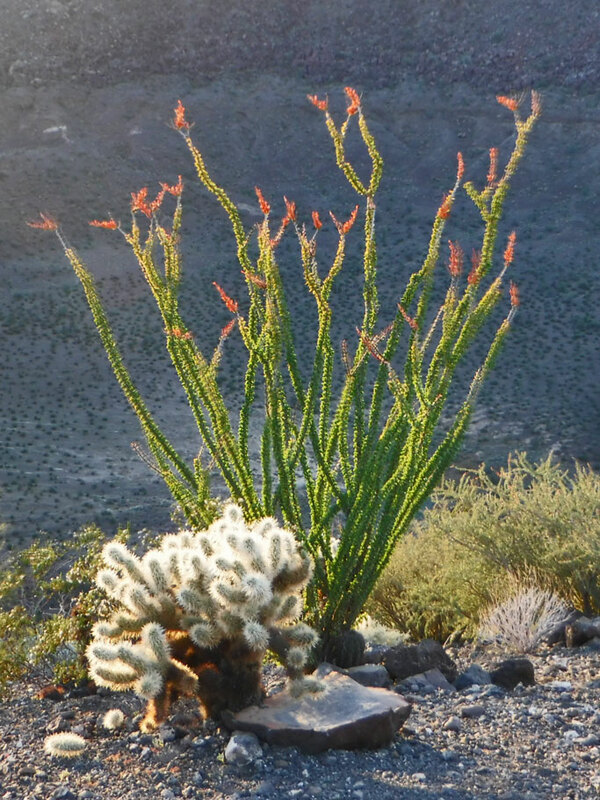 Ocotillo and cholla abound here. Stop at one of the interpretive stations at El Pinacate. 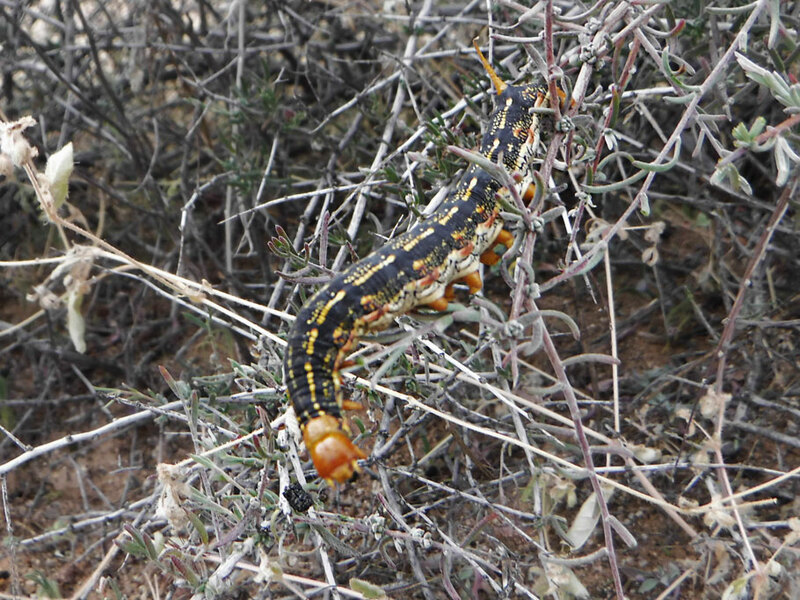 Caterpillars were abundant at a few of our stops in the refuge. Looking into El Elegante. It is the only other maar crater we can visit with 2-wheel drive. It is almost a mile in diameter. The rise on the left is part of a cinder cone that was formed before the crater existed. The steam explosion blew part of it away, leaving a sheer cliff behind. Another look into El Elegante. 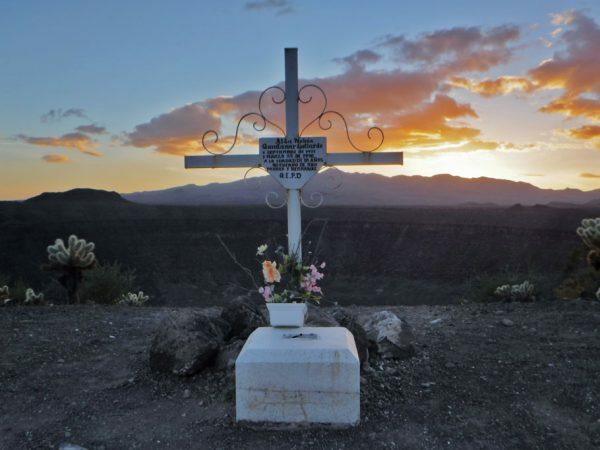 Sun sets behind a memorial on the rim of El Elegante. There was a parking area at the crater. Since we had seen almost no one all day we decided to stay here for the night. We’d save a lot of time tomorrow by driving out the wrong way on our one-way road before the gates opened. This entry was posted in Mexico, Sonora, Travel On The Dirt and tagged Border Crossing, Cerro Colorado, El Elegante, El Pinacate, Km 21, Mexico Border Crossing, Sonora Mexico, Volcano Crater. Bookmark the permalink. Yay!!! You got the volcano hike in at the beginning of your trip!!!! And thanks for sharing good info! Yes, we can say we hiked a volcano but this hike was only around the rim. My goal was to hike up a volcano but sadly we are probably too out of shape to get far. Perhaps by the end of our trip we will be doing more up and down hikes! What a beautiful and fascinating place! But, all that driving on washboard roads would “kill” our van. We’ve done quite a lot of that already and are worried about our suspension. The “lollipop” layout seems like a lot of driving indeed. Thanks for the explanation and for the info about the border crossing. Since we are registered as a camper/RV, the weight restrictions don’t seem to apply to us. What did you guys end up getting/doing for (liability) insurance? Sorry about your suspension. I was hoping it was someplace you could visit. I think you’d enjoy it despite all the driving. We went with Lewis and Lewis for our insurance. It is what we used when we went to Baja earlier this year. They seemed like a good deal then so we didn’t shop around this time. As always, educational and entertaining, with great photos! Thanks Robert! And thanks for reading wherever you are in the world today! Hey Duwan and Greg, Finally found your blog! Looks like you are having a great time. We brought Tamara, (my daughter) and two grandsons down to Puerto Penasco this week. We kind of looked for you, knowing you could pop up anywhere. Due to time constraints, we only did the Pinacate visitor center and several short hikes. It was fabulous. Ed and I are going to return to do the volcano drive probably over the holidays. Thanks for the tips! So glad to hear from you! Unfortunately we didn’t get to see the part of El Pinacate that you did. I think you will love the craters and you will do fine in your truck. Looking forward to seeing you and Ed when we return this spring. I’m having a very enjoyable morning catching up on your blog posts. As always, you guys are funny, educational and have great photos! Thanks! I’m glad you had a good time catching up!